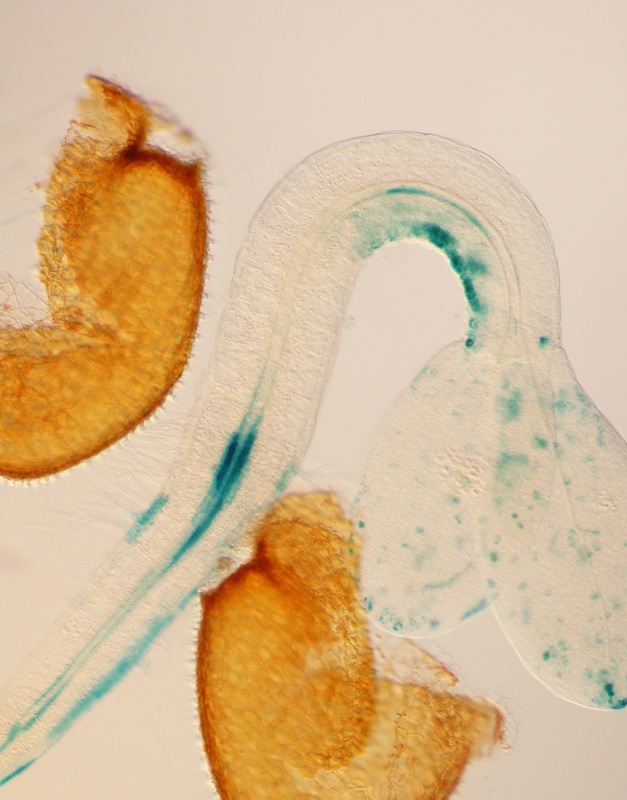 Increased auxin accumulation (blue areas) in the concave side of the apical hook of Arabidopsis thaliana. Increased levels of the hormone auxin usually promote cell growth in various plant tissues. Chinese scientists together with researchers from the Institute of Science and Technology Austria (IST Austria) have now shown that in special areas of the seedling, increased auxin levels trigger a different gene expression pathway leading to growth inhibition. The discovery, published in the journal Nature, helps to explain the formation of the typical bend or so called apical hook that helps the seedling to break through the soil following germination. Varied auxin concentrations mediate distinct developmental outcomes in different plant tissues. For instance, auxin accumulating in stem tissues triggers a gene expression pathway that ultimately leads to increased cell elongation resulting in stem growth. A growth scenario, which cannot be explained in an analogous way, however, is the development of the apical hook that the early plant forms to protect its delicate growing apex when breaking through the soil. In the cells of the inner bend of the hook, i.e. the concave side, auxin accumulates; however, to grow into the form of a hook, the seedling’s shoot must grow less at the inner concave than on the outer convex side. Scientists thus faced a paradox situation and asked themselves: Can auxin do something opposite from what it has been known to do in other parts of the plants? To solve the puzzle, the research group around Tongda Xu from the Chinese Academy of Sciences collaborated with IST Austria plant cell biologist Jiří Friml and his postdoc fellow Zuzana Gelová. By testing various mutants of the model plant Arabidopsis thaliana, the scientists could reveal a previously unknown gene expression pathway triggered by auxin accumulation and leading to the inhibition of growth at the concave side of the hook. While the previously known pathway is located at the nucleus and involves the receptor protein TIR1 (Transport Inhibitor Response 1), this newly discovered pathway starts at the cell surface—and involves a different perception component, Transmembrane Kinase (TMK1), the function of which had been unclear. In the newly discovered mechanism, auxin activates TMK1 at the cell surface and triggers cleavage of the intracellular part of this protein. Within the cell, the cleaved part of TMK1 interacts with specific transcriptional repressors. While auxin degrades similar repressor proteins in the nucleus-based TIR1 pathway to trigger gene expression leading to cell growth, it stabilizes the repressors connected to the TMK1 pathway, resulting in growth inhibition rather than stimulation. Thus, TIR1 and TMK1 interact with different subsets of transcriptional proteins and therefore facilitate auxin signaling by two different mechanisms, allowing the shoot to grow on one side, but not the other. Co-author Jiří Friml: “We have wanted to understand for a long time how TMK1 works as well as whether and how auxin accumulation can function in two different ways. Thanks to our persistence and the major contributions of our Chinese colleagues, we now know both.” Starting from here, it would also be worthwhile to the scientists to understand the full repertoire of the developmental process beyond the apical hook controlled by this novel auxin signaling pathway.